Learning to ride on a balance bike will be the first time that your child is out in the park or on the road on a bike, so this is a great time to get them used to wearing a kids balance bike helmet. This means that they will be safe on their bikes while they are learning and they will have no problem continuing to wear the helmet when they graduate to larger and ‘proper’ bikes. The good news for everybody is that there is a fantastic range of kids bike helmets available, so your child can have fun and look great while they are learning to ride on the best balance bike! Kids balance bike helmets come in all sorts of shapes, sizes, colours and designs and are available from several leading manufacturers. The most important thing to consider when you are buying a child cycle helmet is that it fits correctly. Make sure that you measure your child’s head before you go ahead and select your favourite colour and design, as this can save you a lot of time and effort in returning a helmet that doesn’t go on their head properly! The best way to do this is to measure the widest part of the head, which is above the eyebrows. This will give you the size in centimetres and you can start looking for the correct size of helmet. You can’t really go just on the age of the child, as every child is different so the size of their heads will vary! A general rule is that a small kids bike helmet will be 48-52cm, a medium size helmet will be 53-58cm and a large helmet will be 59cm and above. The helmets are usually adjustable within these size ranges. The main manufacturers of balance bikes such as Puky and Kiddimoto, also provide a great range of helmets to go along with their bikes. There are also fun options such as the Peppa Pig helmet as well as a huge range of other choices. 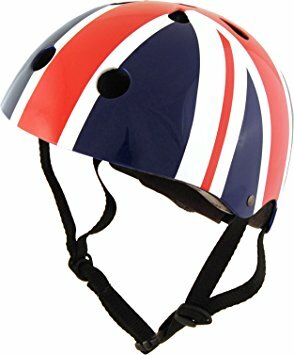 Kiddimoto offers a fantastic range of colourful and stylish helmets, ranging from the Union Jack, (pictured), Pastel Dotty and Blue Goggle designs, to the fun police and firemen helmets and even the Italian Job! These helmets have a rear head adjustment dial as well as a lightweight inner shell with foam pads for comfort and fit. They also have 11 top vents to keep little heads cool, adjustable chin straps and a quick release buckle. They are made to international safety standards so they are perfect for scootering as well as cycling. It will be great fun choosing from this range of exciting kids bike helmets and you can expect to pay between £20 and £25 for a quality helmet from Kiddimoto. 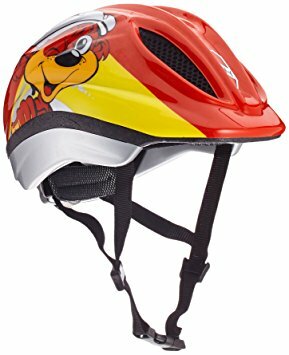 Puky also specialists in children's bikes, and although their range of kids bike helmets is not quite as extensive they offer very good quality and stylish helmets. You can choose a fun red and yellow design (pictured), and helmets are also available in classic pink, ocean blue or kiwi green. These helmets also have a head ring adjustment system, ventilation holes and a strap with raster key lock. One advantage of the Puky helmets is that have a big size range, so they can be adjusted all the way from 48cm to 59cm. This means it may last longer than other helmets as your child grows. The price of a Puky child's bike helmet will start at just under £30, which is great value for a great product from one of the leading manufacturers. It is the perfect accessory to any balance bike, especially a Puky balance bike! A third option and a helmet which is ideal for children riding balance bikes is the Janod Checkered Helmet for Balance Bikes. This helmet is recommended for children from the age of just 12 months, and the size can be adjusted with a toothed wheel. It also features 11 ventilation holes, removable comfort foam and an adjustable chin strap. 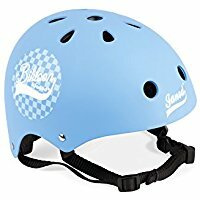 While this helmet may not have the fun designs of the Kiddimoto, Puky or Peppa Pig Helmets, it is very well priced at just £20 and is available in red, pink or blue.